homify 360° is your daily fix of stylish and ultra fantastic architectural creations, in a multitude of settings worldwide. Today’s highlight comes to us from Berlin, decked out in the lovely classic style while flaunting light and airy hues on both the in- and outsides. And because of its serene colour palette, you can expect a calm and relaxing ambience that goes hand in hand with beautifully illuminated spaces (in terms of both artificial- and natural lighting). But that’s not all, for part of this house’s winning recipe is the perfectly crafted garden which surrounds it, as well as all the comfy and stylish amenities that just about any family could wish for. As we said, light colours make up the colour palettes, and for the exterior façade the designers went with snow-white for both the walls and all frames. Here in the back yard, we can see how the house opens up beautifully onto the garden via a wooden deck terrace (complete with a modern seating set) that is shaded ever so slightly via a roof overhang. Ready to see the interiors? As with most open-plan designs, the kitchen and dining room share their space with the living room – and this particular house is no exception. 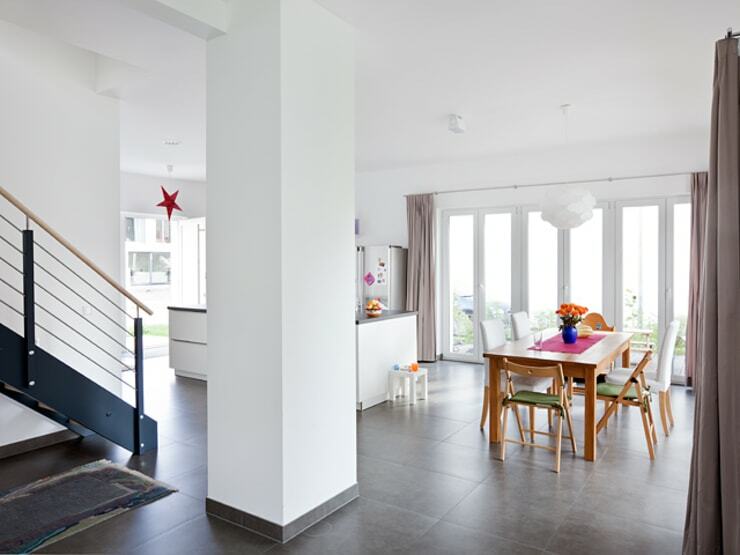 However, we are quite impressed with how the architects have managed to combine the dining- and cooking areas while separating the living room ever so slightly by making use of floor space and a simple pillar. Similar to the exterior façade, the walls are painted completely white, allowing the incoming natural light to bounce delightfully around while illuminating everything from the floors to the ceilings. Notice the cheery pops of colours inserted into the colour scheme via table runners, potted plants and other décor pieces. 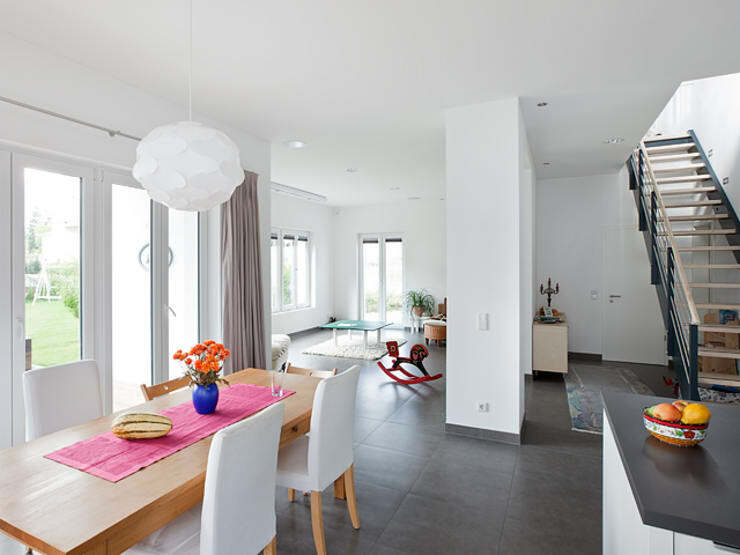 White and grey seem to be the main hues of the kitchen, while the dining space substituted grey with a warm wooden tone, noted in the table and chairs – also a very clever way to visually separate two distinct areas in an open-plan layout. Consider yourself a bookworm, yet don’t have the space (or budget) to treat your lifestyle to a library or reading room? 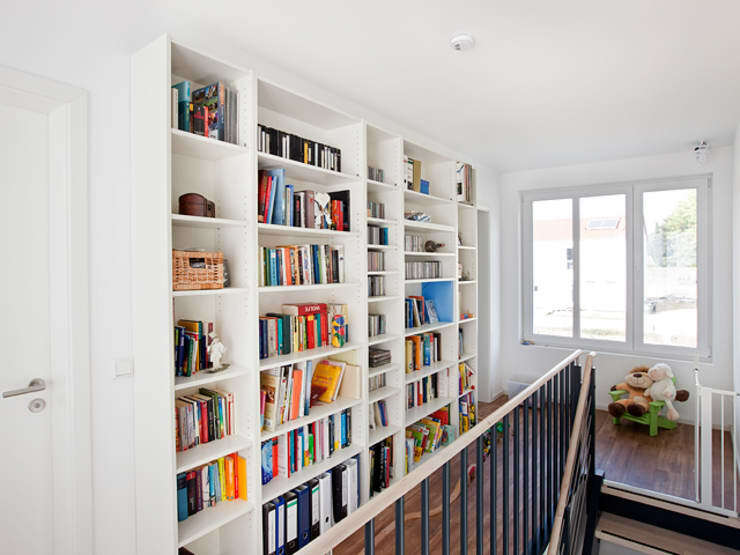 No sweat; just take a tip from this pleasant bookcase which adorns a part of the wall while treating the house’s inhabitants to a multitude of reading materials. Such a lovely addition also ensures that some detail is inserted into a space, especially one with so many neutral tones (which can look a bit clinical if extra care is not taken). Notice how the book gallery is interrupted here and there by a decorative piece or storage basket – a very clever touch to break up the monotony and ensure visual interest. Seeing as we’re not privy to more images of the house, we thought we’d take it upon ourselves to scope out the architectural plans. 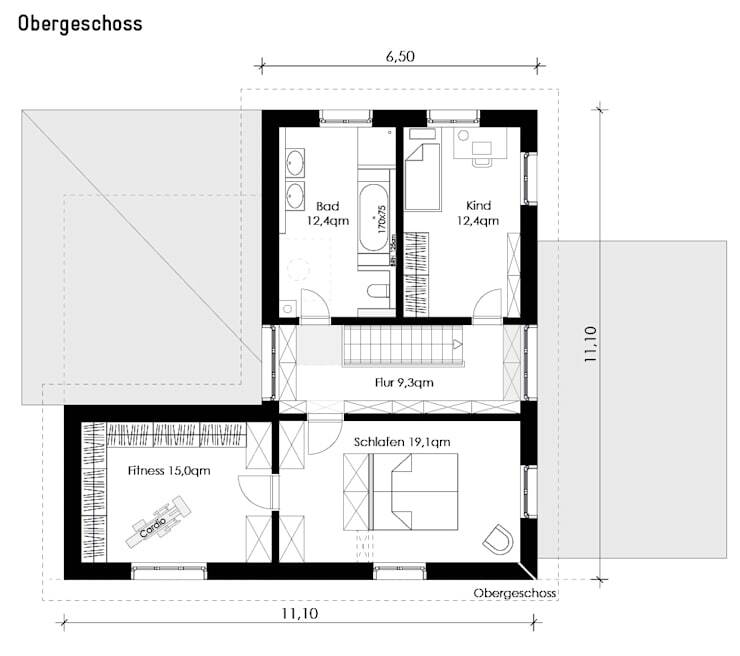 This can give us a bit more detail on the layout of the various rooms. Apart from the open-plan area we’ve already discovered downstairs, we can also see that a guest bedroom is located on this level (where the bed can close up into a sofa and become a second living room). A guest bathroom is also included in the plans, as well as a one-car garage. Time to see what the upstairs space has to offer. The top floor treats us to two bedrooms: a child’s room and the main suite, which opens up onto a fitness room / home gym (pure evidence of these homeowners’ commitment to a healthy lifestyle). A spacious bathroom (which includes two sinks as well as a bathtub and a shower) is also included upstairs. 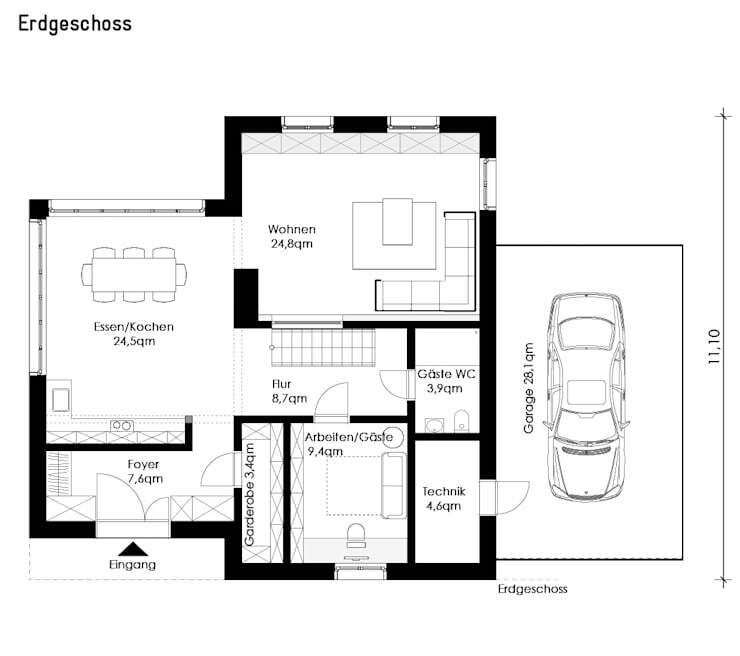 Yet, judging from these plans and the house’s physical layout, there is still plenty of space to add more rooms (such as on top of the dining room) for when the family decides to branch out at a later stage. Speaking of young families becoming bigger, take a look at our Fantastic bedroom ideas your child will love.